Enjoy the transformation power of a whole weekend joined in harmony! Give yourself the treat of dropping deep into harmony with a weekend brimming with new compositions and old favourites and space to open and weave both voices and hearts. 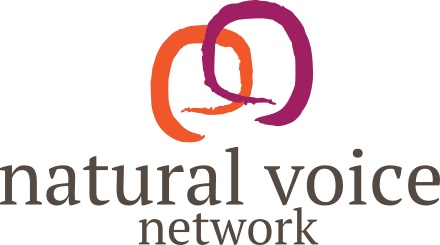 Singing for this length of time is such a potent way to come into the present moment and let all the worries of life drop away and to connect deeply with ourselves and others. 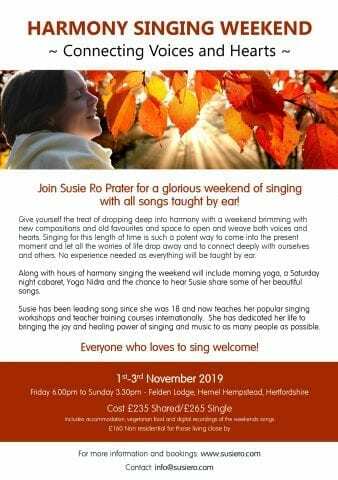 Along with hours of harmony singing the weekend will include morning yoga, a Saturday night cabaret, yoga nidra and the chance to hear Susie share some of her beautiful songs. Susie has been leading song since she was 18 and now teaches her popular singing workshops and teacher trainings internationally. She has dedicated her life to bringing the joy and healing power of singing and music to as many people as possible. No experience necessarily as all songs taught by ear, everyone who loves to sing welcome! Everyone attending will receive digital recordings of all the songs from the weekend. The weekend will be held at Felden Lodge, which is set in 32 acres of beautiful grounds on the outskirts of Hemel Hempstead. It is within easy access of the M25 (J20) and M11 (J8) and 30 minutes by train from London Euston.